Luxury Items for Your Custom Home: Decor and Tech - Canterbury Homes Inc.
A custom home will give you endless opportunities to create the home that reflects your personality and your lifestyle. If you are looking for ideas and inspiration, this article is for you. You might find a luxury item you want or need. In our last blog, Luxury Items for the Kitchen and Bath, we shared some luxury items and trends that many of our clients request for their kitchens and bathrooms. These included highly sought-after items such as steam and wall ovens, top-of-the-line toilets, custom showers for two, and shared the latest trends for the kitchen and bathroom. Choosing special items can impact how you design your home from the ground up, focus on items that suit your lifestyle and consider your needs and wants. There are many options, even basic items like a doorbell or a backsplash–can be made modern, edgy, or any way you want it! It’s your dream home, personalize and customize it with items you love. Imagine, lighting that adjusts as you move through your home. Smart bulbs with built-in radios. Apps to connect your whole home. If motion sensors or smart lighting interests you, consider incorporating it into your custom home build. Features will vary depending on the system, contact us at Canterbury Homes or the lighting experts at Robinson Lighting and Bath for recommendations. A video doorbell for the front door is a luxury item, and also a practical essential, when building a new home. Today’s homeowners can get more from their doors. A camera allows you to check on packages, see and speak to visitors remotely in real time, double as a security camera, watch your kids come and go, and more. It’s like having a super-efficient butler. 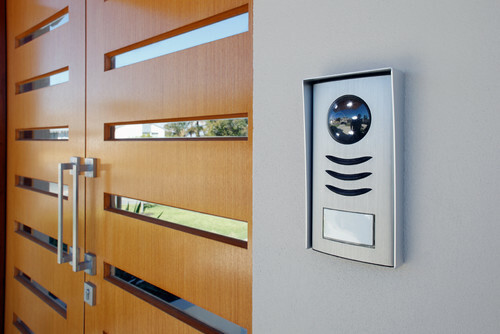 Clare Controls’ video doorbell is a stylish addition to your custom home’s entrance. It’s sleek, modern, and sure to impress. A smart thermostat automatically adjusts to your habits. It can learn when you want it warm and when you want it cooler. You can also control it from your smartphone, making getting out of bed before the house has warmed up a thing of the past. The Nest E Thermostat saves you money, adjusts to your lifestyle, and blends beautifully into its surroundings. There are a lot of options when it comes to countertops for a bar or kitchen island. Tile, butcher slab, glass, marble, granite, concrete, etc. One option that stands out is luxurious Onyx. Its natural colourations resemble art and can be underlit for a soft glow. It comes in many colours, you can decide which hue to radiate from the island when the lights are dim. It appears to be light and delicate–you can almost see through it. Natural onyx is a softer stone, it requires careful sealing, proper support, it is costly, and requires regular maintenance. However, the dramatic use of stone is sure to be a big hit with guests. 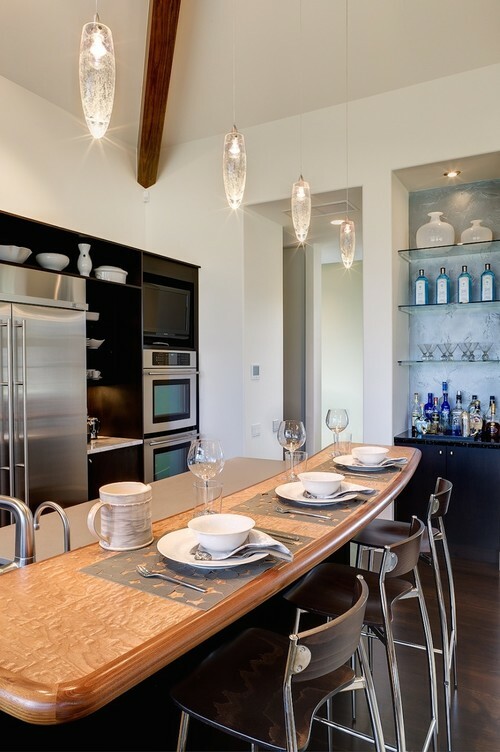 For added luxury in the kitchen, consider pendant lighting over your island, wrap-around countertop, or bar. 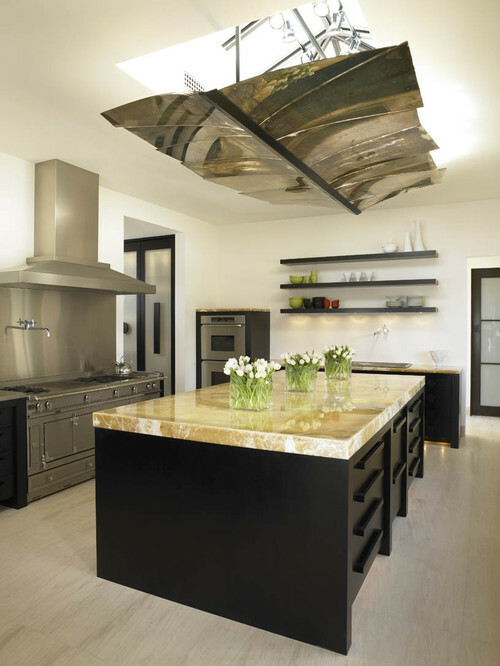 Pendants can be used to enhance your style, create another level of lighting and add sparkle. Pendant lights available in many styles and sizes, from modern to rustic. In the photo below, the pendant lights brighten the space and add to the modern elegance of this kitchen and dining area. A new year is upon us and the trend for 2018 continues to be mixing metals. Our luxury homes often feature light neutral colours, greys, and brushed finishes for appliances. Brushed finishes such as matte black or matte chrome reduce fingerprints, which is ideal for busy homes and families. Light colours give a home a clean, current look. To change things up, vibrant accents like throws, art, and furniture can add character and drama to a room. In the photo above, the homeowner has chosen a neutral palette for the walls, furniture, and floors and elegantly added splashes of colour with the light green curtains and pillows. Granite/Marble for vertical surfaces more than just on countertops, a matte finish looks like concrete. Try mixing shiny and matte finishes to add some textural interest. Wallpaper has been used for decades, we have seen wallpaper trends rise and fall. It reflects both current and traditional styles of our past. It’s a dynamic way to add an element of pattern or texture to a room, a little can go a long way. Luxury home builders are choosing wallpapers that are ramped up another level: embellished, adorned, textured, and exotic-looking walls are appearing in modern luxury homes. If you’ve always dreamed of velvety walls, walls adorned with Swarovski crystals, or metallic geometric designs that compliment your light fixture (as pictured below), you can achieve it with wallpaper! The look of hardwood is as popular as ever, but some homeowners want floors that are more durable, comfortable underfoot and long-lasting. Authentic wood floors can scratch, fade, and get damaged from daily use. There is now another option, cork flooring. It is available in the similar hues and finishes as real wood and is so realistic that it’s hard to tell the difference between hardwood and cork, for example. Cork flooring that looks like hardwood comes with all the benefits of cork flooring (durable, soft underfoot, low maintenance) without the drawbacks of natural wood. A luxury item for your floors. For some, having plants growing inside year-round is a must. A daily dose of greenery can help get us through those long Edmonton winters, and it’s also nice to have fresh herbs at your fingertips constantly growing in your kitchen. Or use it to get a jump on seasonal planting. 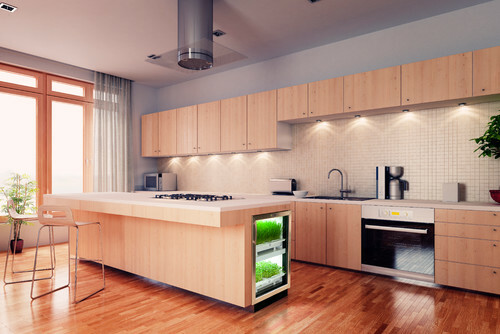 The Urban Cultivator is a seamless and functional indoor garden for growing small plants. It is installed below a counter for convenient maintenance and harvesting. This system resembles a high end appliance. What is on Your Luxury Item List? Did any of these items make your list of wants or needs? With so many customization options, it can be hard to choose, we hope this blog gives you some ideas and inspiration. Did we miss any luxurious custom home items that you want info and examples of? If you enjoyed this blog, click the share buttons to share it with your friends!